Welcome to the first part of the Eastern Suburbs School of Music review of the KISS studio discography. The band celebrated 40 years in the business in 2014 and still tour the world regularly. There have been many different line ups and phases during this time. In part one of this analysis we will focus on the album releases of the original line up. Like their heroes The Beatles, all members sang lead vocals and had unique identifiable personalities. These personalities were captured in the design of the face makeup worn by each band member. You wanted the best, you got the best….KISS. The debut album contains many classics performed regularly in the live show today. “Deuce”, “Firehouse”, “Cold Gin” and “Black Diamond” are must listens for any fan of classic rock. While the recordings are fairly muted in comparison to how they would be presented live (listen to the 1975 hit breakthrough “Alive”) the energy of a hungry band is apparent. Guitarists learn “Deuce” rhythm parts and the smoking solo by Ace Frehley. Bass players learn “Strutter” for a classic Gene Simmons walking bass part. Drummers learn “Nothin to Lose”, KISS sneak in a riff in 7/4 time. The band re-enerted the studio in 1974 looking to capture more of the raunch and energy of their live performance. While the sonics of Hotter Than Hell are disappointing sludge, the songs are heavier riff based rockers. Guitarists learn “Parasite”, riff rock mastery. Bass players learn “Goin’ Blind”. This has to be one of the most perfect power pop albums of all time. 28 minutes of crunchy rock pop gold. Guitarists learn “Rock Bottom”, stellar acoustic intro and rocking song that follows. Bass players learn “Rock and Roll All Nite” the bass line MAKES this song. Drummers learn “Love Her All I Can” contains a drum solo section. After the mega success of their live album “Alive”, KISS return to the studio with famed producer Bob Ezrin. Together they created a masterpiece with all time classics such as “Detroit Rock City”, “Shout It Out Loud” and their biggest hit single, the string laden ballad “Beth”. Guitarists learn “King of the Nighttime World”. Bass players learn “Detroit Rock City”. Drummers learn “God of Thunder”. My personal favourite, this is KISS at the height of 70s rock guitar glory. Guitars rock, drums are swinging and bass thumping on this great 70s rock album. Produced by Eddie Kramer who also was behind the boards for Jimi Hendrix among others. Guitarists learn “I Want You”. Bass players learn “Ladies Room”. Drummers learn “Calling Dr. Love”. The blending of production excess seen on the Ezrin produced Destroyer and the raw rock power of the band. 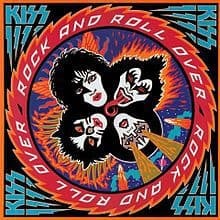 this was the first KISS album I had after loaning it out from the local mobile library on cassette. This was remastered in 2014 with bonus disc of demo, live and interview clips. Guitarists learn “I Stole Your Love”. Bass players learn “Love Gun”. The band reconvened after releasing solo albums in a somewhat fractured state, with drummer Anton Fig playing in place of Peter on all but one track. The success of hit single “I Was Made for Loving You” branded this album as KISS going disco but is anything but. It contains some darker, heavier tunes lost in the catalogue such as “Magic Touch”, “Hard Times” and a great cover of the Rolling Stones “2000 Man”. Guitarists learn “Save Your Love”. Bass players learn “Sure Know Something”. The last hurrah of the original line up on paper. The reality was band members were working independently and including session musicians to fill out their tracks. Drummer Peter Criss does not play on the album at all and soon left the band. The glossy production also alienated fans of the original albums, while the song writing has become far more intricate. This album was a massive hit in Australia where the band toured for the first time and were greeted with scenes similar to Beatlemania. Guitarists learn “Talk To Me”, check out the open G tuning.